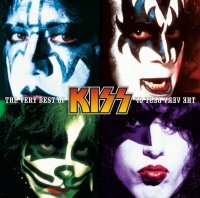 With Kiss hitting UK shores earlier this year*, what better way to celebrate than with a 'Very Best Of' compilation? After all, there aren't many of those around, are there? Unlike 2008's 'Jigoku-Retsuden', 'Kissworld' is no re-recorded or re-imagining and neither are any of the twenty tracks rare or unreleased. What is unusual is that the split between the early "face paint" years and the "unmasked" era (and subsequent "re-masking", of course) is as near to fifty-fifty as you're liable to get, falling eleven to nine in favour of early classics. With this album's motivation appearing to celebrate the band's UK appearances, maybe that's not such a shock, what with their "unmasked" days being their most consistently popular in the UK in terms of sales. Therefore, opening 'Kissworld' with the band's joint biggest UK hit, 'Crazy Crazy Nights', makes sense, as does the early appearance for its charting equal 'God Gave Rock 'N' Roll To You II'. Squashed in between comes the anthem 'Rock And Roll All Nite' and the Disco smash that's gone deeper into the UK psyche through movies, musicals and video games, namely 'I Was Made For Lovin' You'. From there things veer from the expected to the expected via a few minor surprises, 'Love Gun' and 'Detroit Rock City' rubbing shoulders with 'Heaven's On Fire', 'Unholy' and 'Tears Are Falling', although the inclusion of less obvious early(ish) tracks 'Calling Dr. Love', 'I'm A Legend Tonight' and 'Shandi' are also welcome. Tacked on the end comes 'Modern Day Delilah' and 'Hell Or Hallelujah', their placing at this collection's tail leaving the feel that Paul Stanley, Gene Simmons, Eric Singer and Tommy Thayer are waving meekly to remind us that they have actually recorded some music of their own, although to be fair, neither are exactly out of place. With 'Lick It Up' also making the cut, the other welcome side to this latest compilation is that it not only features the band's latest incarnation, or its original, instead encompassing all the guitarists and drummers who've officially been part of the band and even some who haven't. The completist in me is delighted to add 'Kissworld' to the embarrassingly large Kiss collection I already own. However, unless you fall into that category, or have somehow avoided these songs over the past four and a half decades, you really don't need this, even if the songs are universally excellent.